Large Excavation – Our bigger equipment allows us to make repairs and installations which require large areas of land excavation. The efficiency of the larger equipment during big jobs allows us to be competitively priced and also helps us get the job done in the shortest time possible. 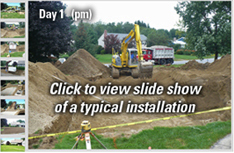 Small Excavation – Our small equipment allows us to make repairs in “hard to get to” areas without destroying your yard. This can save you hundreds of dollars in a non-intrusive manner.